The Prytulak Crew was one of the original crews for the 492nd BG that trained in Alamogordo, New Mexico. They transferred in as crew 1096 from the 32nd CCTS (Combat Crew Training School) in Tucson, Arizona, on 5 Jan 44. While training with the Group no personnel changes were made. They were assigned to the 859th BS, designated as Crew 907. 2nd Lt Donald Prytulak signed out for a B-24J, 42-110141. The crew named their ship BREEZY LADY. In April 1944 they flew their assigned aircraft to North Pickenham, England, via the southern route. Sgt Smith, their ground Crew Chief, flew with them, thus bumping Cpl Floyd onto the Queen Elizabeth. Lt Prytulak flew as the aircraft commander for Crew 907 for 28 missions with the 492nd. They did 3 more missions with the 467th BG. They got in an extra one becuase they had an aborted mission for which they weren't credited until after they reached their tour tally of 30. We can't be positive of all of the personnel changes that might have been made on some of their missions. For reasons unknown the Prytulak Crew and the Harding Crew switched bombardiers upon arrival to North Pickenham. After the war Lt Williams, the new bombardier from the Harding Crew 902, attached his personal notes to Heath's diary on each of the missions flown by Prytulak Crew 907. The full copy of the war diary can be read using the link "T/Sgt Heath's Crew 907 War Diary" under "Stories" to the right. Shortly after the Crew began flying their missions, one more personnel change took place. Capossela traded crews with Cronemeyer of the Earleywine Crew 901. Cronemeyer is pictured with the Crew on 21 Jun 44. The switch was therefore made after that. Another change encountered was the BREEZY LADY was taken from them. Since the Group had all brand new J models, it was decided by the upper brass for the 492nd to swap some of these with older H models flying in the 458th BG. Prytulak and company drew the short straw for the BREEZY LADY. The 458th retained the name for quite sometime before remaning it. See its aircraft page. Although unconfirmed, it is believed that the H model they received was named OONIE DOONIE by the crew. No one recalls ever painting any kind of nose art on the plane. Some say that because they did not, it was not officially unofficiallynamed. Note: All names and nose art were unofficial according to the USAAF. There is a photo of a door plaque that hung inside the Prytulak's hut. It displayed the running tally of missions flown by Prytulak's OONIE DOONIE crew. 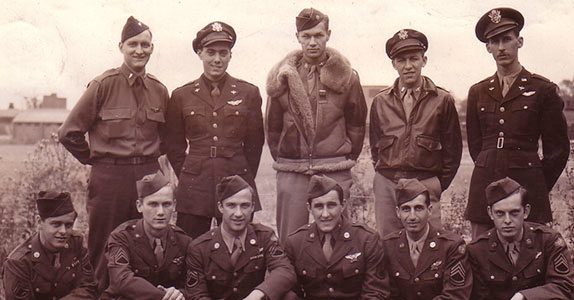 When the Group was disbanded, the Prytulak Crew 907 was transferred to the 467th BG, 788th BS. There they became designated as Crew #7.